Alan McConchie works at the intersection of cartography, software, and data science. He has an undergraduate degree in computer science and mathematics, and studied geographic information systems at Hunter College in New York. 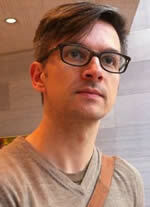 He is currently a Ph.D. candidate in geography at the University of British Columbia in Vancouver. His dissertation research uses OpenStreetMap as a case study to understand the social dynamics of crowdsourced mapmaking online. He loves making cartographic visualizations that reveal new ways of seeing the world, and is passionate about creating tools that help people create their own maps and tell their own spatial stories. He is on twitter at @mappingmashups, where he hosts a biweekly twitter discussion called #geowebchat. His first and (so far) most famous programming project is the Pop vs Soda page.